And now for some sound advice! 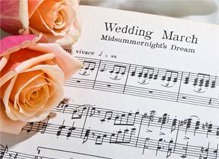 At many Noosa wedding ceremonies, music plays a major role in the ceremony. Some go to enormous lengths to create a special soundtrack or hire a soloist or small band to play before, during and after. Others are content to use their phones or tablets to provide a little background harmony. From my experience, it’s lovely to have some appropriate music playing as your guests arrive, giving your ceremony a lovely ambience right from the start. Then, of course, the bride’s dramatic entrance provides an opportunity for a favourite song or instrumental. For many, it’s a once-in-a-lifetime experience so I believe that, despite all the other things to organise and worry about, it is worth putting a bit of thought into the music. Is there an appropriate song that has special meaning for you both – that touches your soul? Or perhaps the tune that was playing the first time you met? Or maybe chose a very current song that will always be remembered from the year of your marriage. From then on, it will always be ‘Your Song’! Live music can b e amazing at a wedding ceremony. Having family or friends singing at the bride’s procession is just amazing. I’ve even had grooms singing and writing songs for their brides, and when their voices got a bit emotional it just added to the occasion. With regard to playing pre-recorded music, there are also a few things to consider. If you are downloading music for your ceremony on your phone or tablet, allow 30 minutes worth for the pre-ceremony period as the guests arrive plus a couple of songs for ‘The Signing’ and at least 5 to 10mins post ceremony. Again, you will likely need some form of amplification. Normally, I am happy to play couples’ music through my own sound system, provided one of the guests takes charge of it. Be careful if you disable the passcode on your electronic device, the battery can drain very quickly. Don’t leave your device in full sun – it will just stop working if it gets too hot. Please recruit someone responsible and reliable to look after the music.